50% Discount on Trademark Searches in April! When you start a business or bring a new product to market, you may not be thinking about first doing a trademark search. Why spend money on lawyers instead of investing in the business, right? Wrong! Not hiring a lawyer to do a trademark search can cost you many thousands of dollars, months of wasted time and effort, and your position in the marketplace. We care about this issue so much that we’re offering you a 50% discount on new trademark searches when we begin the project before the end of April. It’s the best deal we’ve ever offered, so take advantage of it today by e-mailing us (or call us at 610-892-9942). 1. Your business name could infringe on the trademark of a large and established (and now very unhappy) company. 2. Create and protect distinctive branding. When you initiate a product or service, you'll want to be confident that its branding is distinctive, able to build up goodwill in your favor. If your brand or logo isn't memorably different from a competitor's, you risk inadvertently losing trade to them. 3. Reduce your risk of getting sued for trademark infringement. You'll want to avoid getting sued by a competitor for infringing or diluting its trademark on related products. As mentioned above, they could demand that you change the name and even sue you for monetary damages. Re-branding would involve both direct costs and loss of whatever goodwill you've built up over time. 4. Your trademark will give you exclusive rights to your branding. When you apply to register it with the Patent and Trademark Office ('USPTO'), an Examining Attorney will search their records for current registrations that would disqualify yours. You're far more likely to succeed at this step if you look in the USPTO trademark registry before you leap. Consider not only the trademark itself but also the listed goods or services. Even if an identical term is registered, your mark won't necessarily be precluded if the goods or services are so different from yours that they would move in different channels of trade. But beware of registrations for similar products even if the marks are somewhat different, but have enough similarity in look, pronunciation or meaning (including translation from a foreign language) that a customer might be confused as to their source or sponsorship. The legal test for this is 'likelihood of confusion,' and here it will be valuable to take advantage of the expertise of a seasoned trademark lawyer. 5. Another company may already have common law trademark rights. Even if there isn't a federal registration of a conflicting trademark, it's possible that another company has accrued trademark rights by using the trademark in interstate commerce, under 'common law' principles. In that situation, the company would be entitled to file a formal Opposition to your trademark application, even though it's been 'allowed' by the Examining Attorney. To minimize the likelihood of this happening, it's important to search additional sources, such as websites on the Internet. 6. Reserve the related Internet domain name. You also want to confirm that a related Internet domain is available for your website. If someone is already using a dot-com version your term, consider that a variety of specialized domain extensions have recently become available. http://data.iana.org/TLD/tlds-alpha-by-domain.txt So if you're going to sell exercise devices, you could register a domain name ending in dot-fitness. 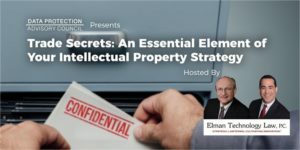 Trade Secrets: an Essential Element of Your Intellectual Property Strategy. In December, we presented a webinar for the Data Protection Advisory Council ('DPAC'), on the topic of Trade Secrets: an Essential Element of Your Intellectual Property Strategy. The next presentation by the DPAC will be April 23rd at 3:00 PM EDT. Joshua Marpet of Red Lion compliance and risk management services will speak about the 'California Consumer Privacy Act, less than a year out. Are you scared?' followed by a campfire-style, ask-me-anything discussion among DPAC members and the audience. Register for free to participate with us. Download the presentation on Trade Secrets: an Essential Element of Your Intellectual Property Strategy using the form below. Learn how Google Doodle can run an Artificial Intelligence tool in your browser to emulate musical composition by Bach. And now Click here for the Google Doodle.